Watch_Dogs was announced to a great deal of fanfare at Ubisoft's E3 2012 press conference, swiftly gaining a media narrative as the first truly next-generation title. More so both presentation and marketing latched onto the Zeitgeist surrounding the potential for a monolithic surveillance state - real or imagined - administered by powerful corporations tracking your every move. The Edward Snowden leaks and further revelations on the nature of government spying by the NSA et al unsurprisingly lent Watch_Dogs an aura of relevancy long before concrete details of the project were known. Trailers looked stunning, naturally, but the major development milestone was the concept of drop-in multiplayer – playing a game which was for all intents and purposes single player and then being 'invaded' by competing players to fight over some objective. And yet even though hacking was a major plot point the mechanics were heavily downplayed, giving way to fare more in common with major action/adventure franchises such as Grand Theft Auto or Uncharted. Nonetheless being able to do all this in a near seamless open world is alluring. Unfortunately since its announcement Watch_Dogs went through a series of delays; at one stage due to be a launch title for the PS4, the game was pushed to the Spring (and finally May 27th) with only weeks to go. Hopefully Ubisoft have had enough time to smooth out the rough edges and unveil a title which excels on all platforms. The Setting: Chicago of the not-to-distant future. Chicago, long recognised as a crime hotspot in the US, has in the near-future had all city infrastructure integrated into one seamless system – the Central Operating System (ctOS) - with a highly pervasive reach into all corners of life. Apparently intended to streamline city resource allocation and improve emergency response times, the depth of ctOS's tendrils have proved to be fertile ground for high tech. criminals in search of information or cold hard cash. You are Aiden Pearce, Watch_Dogs' not-so-silent protagonist. Whilst some of Chicago's underworld try to exploit the new regime in the comfort of their basement, advances have meant that you sometimes need to get your hands dirty - Aiden is just the man for the job. He specialises in getting physically close to computer nodes undetected so a hack can be deployed via his smartphone, and then getting away clean. Unfortunately not all goes well for Aiden and his partner in crime Damien Brenks. When on an ill-fated mission for illicit information they are compromised by another hacker, leading to Aiden and Brenks being targeted and the death of Aiden's niece. One year on and Aiden is playing the role of solo 'Vigilante', divorcing himself from a reckless and now-crippled Brenks whom he blames for his niece's murder, carving out a name for himself on the streets of Chicago in the process. Just starting to regain some semblance of a relationship with his sister Nikki and nephew Jacks, he is also still searching for answers in his niece's death. This search has led to associations with yet more unsavoury characters, putting himself and others at further risk. 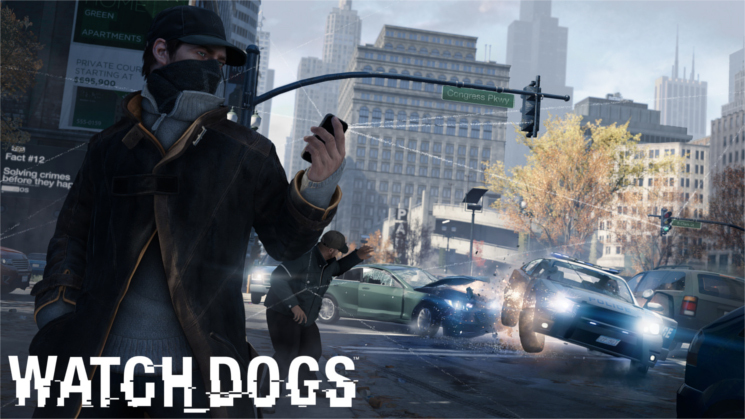 Watch_Dogs immediately sets itself in the mould of revenge thriller attempting to lead the player through twists and turns as well as underworld politics. It's a testament to the writing team that many of the twists don't feel too contrived, but from hour one you are at times left wondering why Aiden and Brenks haven't been summarily dispatched long before now. Aiden himself hardly seems to be a heroic figure despite the repute of his alter-ego 'The Vigilante', and continually places others as well as himself in harms way. The strong narrative focus of the game therefore drives you onwards if such stories hold your interest, but may make subsequent playthroughs for additional content unnecessary. A deep philosophical discussion on the nature of privacy in the information age it isn't.